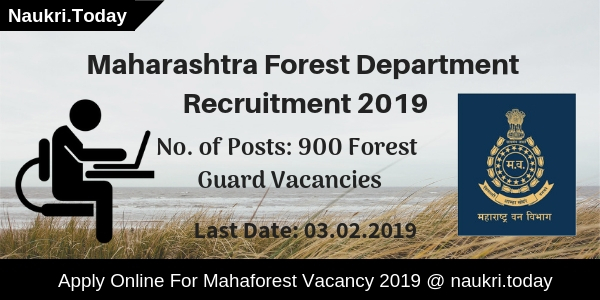 Maharashtra Forest Dept Recruitment 2019 is available for Forest Guard Posts. There is 900 Vacancies are available for Mahaforest Vacancy 2019. Interested candidates may fill up their application form before the last date that is 03.02.2019. 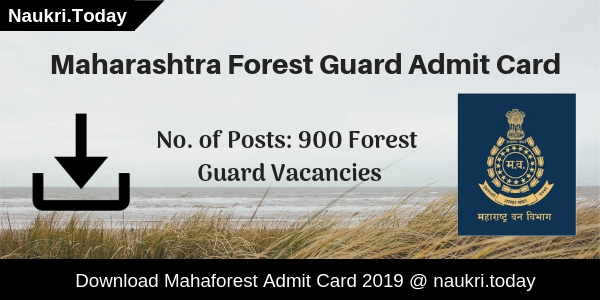 Aspirants must check qualification, age, and application fee before applying for Maharashtra Forest Guard Jobs 2019. The registration process for Forest Guard posts will be started from 14.01.2019. Our team has provided you complete details such as application fee, etc in the below article. Fresh Updates as on 22.02.2019: Hello Friends, applicants who are going to appear for Maharashtra Forest Exam 2019 can collect their admit card from here. Participants can download their call Letters from diirect link given here. Candidates who are going to apply for Maharashtra Forest Dept Jobs 2019 must fill up their application form carefully. Before applying aspirants should check here eligibility criteria details from here. Eligible candidates may fill up their Mahaforest Application Form 2019 form links given here. Applicants who have 12th Pass certificate with on the following subjects given below can apply for Mahaforest Jobs 2019. The 12th Pass Certification should be registered from any recognized university or institution of government. For further more details candidates may refer to the official Maharashtra Forest Dept. Notification 2019. Here we gave you links to download Maharashtra Forest Department Recruitment 2019 notification pdf form here. Participants may not be less than 18 years and should not more than 25 years are eligible for Mahaforest Recruitment 2019. Upper age relaxation is applicable as per department rule for Maharashtra Forest Guard Jobs 2019. Candidates download official Notification of Maharashtra Forest Dept Vacancy 2019 either from here or from the official Website. Aspirants need to pay some amount as an application fee for Mahaforest Vacancy 2019. Candidates who belong to Unreserved Category have to pay Rs. 500/- and Reserved Category aspirants will pay Rs. 350/- For an examination fee. Candidates can submit their application fee through online mode as well as BHIM UPI. Applicants should use their Credit Card, Debit Card or internet Banking for the payment of Maharashtra Forest Dept. Recruitment 2019. Candidates should be selected on the basis of Written Examination, Physical Test, and Running Test. Candidates firstly take part in the written examination. Applicants who qualify in Written examination will allow participating in Physical Test & Running Test for Maharashtra Forest Dept jobs 2019. 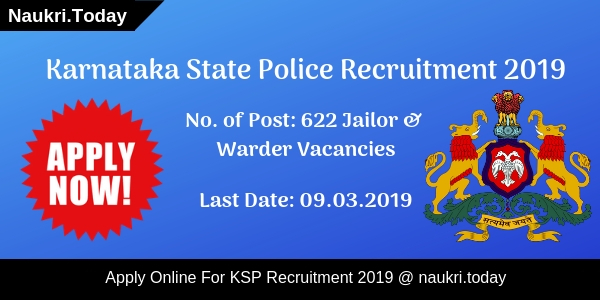 Participants who get successfully get qualify in Physical Test and Running Test will get selected for Vanrakshak Recruitment 2019. Contenders may download Maharashtra Forest Dept Notification 2019 form links given here. Aspirants who fulfill given below physical Standard will qualify in Physical Test for Maharashtra Forest Dept Vacancy 2019. Candidates may also be required to improve their Running Abilities to get qualify in Running Test of Maharashtra Forest Dept Recruitment 2019. The Department will Pay a good amount of salary to the selected candidates. Participants will get Rs. 5,200/- to 20,200/- for Maharashtra Forest Guard Jobs 2019. The Department may also pay Grad pay of Rs. 1800/- For Mahaforest Recruitment 2019. For furthermore details aspirants may refer to the official Mahaforest Notification 2019. Log on To the Official Website of Maharashtra Forest Department that is mahaforest.nic.in or mahapariksha.gov.in. After that Search for Maharashtra Forest Dept Recruitment Section at Homepage. Now open Mahaforest Vacancy PDF and Read it carefully. Eligible candidates may apply online for Maharashtra Forest Guard Vacancy 2019. After filling up an application form submit an application fee through a suitable method. Recheck you Mahaforest Online Form before submitting it. Must Keep on a copy of Registration form for feature use. Conclusion: Maharashtra Forest Department has released notification for filling up 900 Forest Guard Vacancies. Candidates may check here eligibility criteria for Maharashtra Forest Dept Recruitment 2019. For further more information applicants may refer to the above article. Govt. Job Seekers there is a great news for that Maharashtra Forest Dept Recruitment 2016 notification has been released. Department has recently announced the notification for 43 Forest Guard Posts. It has published that Online Application will be submitted through its official website. Candidates if you are eligible then submit application form on or before 17.10.2016. Check the complete recruitment details given below. Know About Maharashtra Forest Department : Forest Department of Maharashtra was established by the Govt of Maharashtra. The main motive behind the establishment of the department is to provide better facilities to Forest Life. Recently department has announced the Maharashtra Forest Department Recruitment notification for 43 Forest Guard Posts. You may check the complete details at its official website. Educational Qualification for Forest Guard Jobs : Candidates must have passed the 10th Standard from a recognized Institute. You should also pass the Physical standards as given below. Pay Scale for Jobs in Forest Department : Candidates selected for Maharashtra Forest Department Forest Guard Jobs will be paid 5200-20200/- + 1800 per month. Application Fee for Maharashtra Forest Dept Recruitment : Candidates you have to pay 150/- as application fee for Forest Guard Jobs. Selection Process of Maharashtra Forest Guard Vacancy : A Physical Efficiency Test will be organized for the selection of candidates. Candidates Log on to the official Website maharecruitment.mahaonline.gov.in. Click on the Maharashtra Forest Recruitment 2016 Notification. Read the complete details carefully before applying. Click on given Apply Online link. Enter the complete required details and submit it. Download the Application Form for future use. Maharashtra Forest Dept Recruitment 2016 | Forest Guard Vacancy : Maharashtra Forest Department has announced the notification for 43 Forest Guard Vacancies. Candidates who are interested in Forest Guard Jobs may submit online application on or before 17.10.2016. Further recruitment details can be fetched through its official notification.